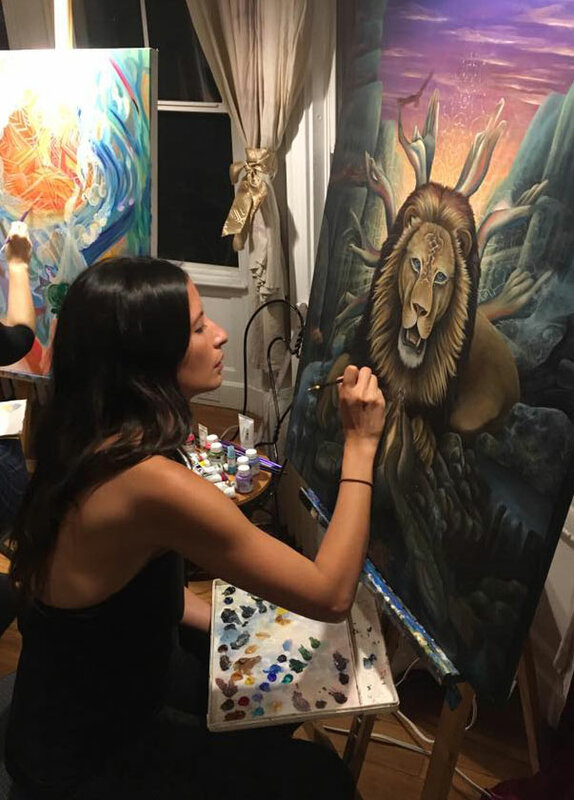 "Paint your Spirit Animal with visionary artist Li Lian Kolster - august 2019"
7-day workshop for both beginning and advanced painters. We are honored to have amazing artist and teacher Li Lian Kolster teaching in Belgium for the first time! Li Lian is a master in making amazing Spirit Animal paintings, coming from her own meditations, immersion in nature and apprenticeship in the Amazonian Shipibo tradition. After hearing so much wonderful stories about her way of teaching, we reached out to her and we are deeply grateful she agreed to bring her wonderful work to the Anam Cara center. Bring your vision to life on canvas. In this 7 day workshop, you will be guided in working with spirit animals as powerful and guiding allies in your journey and self understanding and make a beautiful painting, filled with power and soul. Li Lian will share her own experiences of working with different animal medicines in her own shamanic practice and guide you through all the steps of her painting method. Make the inner journey to the Spirit Animals and learn to paint them. You will be assisted to find your own personal guides through guided inner journeying and visualization. Through a 30 - 40 minute guided mediation and Shipibo chanting, Li Lian will help you to journey deeply, receive visions and experience encounters with different guides. From this there will be some quiet time for you to sketch, make notes and collect ideas for your drawing which will be the basis of their painting. Li Lian will guide you in constructing a composition for their drawings whilst encouraged to contemplate the deeper meaning behind an animal and the teachings that it may hold for you, as further inspiration the formation of their paintings. The workshop will be marked by an opening and closing ceremony to bring intention to our time together, inner journeying and painting practice. To find and foster our connection to our spirit animals, receive their messages and bring this to creation on canvas. Li Lian has developed her own method of painting, which will help you simplify your painting process and give you ways of deepening your painting skills. Her method and way of teaching has proven to be very good for beginning painters, as it gives you a clear framework to build your composition and make a beautiful painting. Li Lian is recognized as a great teacher for painters of all skill levels, with a good sense of what is needed for her students and a dedicated practice of one on one teaching, so all students receive good guidance. Through presentation, practical demonstrations and one-on-one guidance, Li Lian will share her knowledge in rendering effective volume and texture and use of colour to help you bring your vision to life on canvas. Core concepts which Li Lian uses in her practice of direct painting with acrylics. The use of values to create contrast and composition, and the approach of premixing paints with value strings. For those who are more familiar with painting with the mische technique, this will provide an interesting alternative way to think about constructing a painting. How to mix colour, making a value scale and the blocking in of general areas. This helps to train the eye to see value in colour and the placement of general areas of lights and darks within a composition. - Since the number of students is limited and studying with Li Lian in Europe is a rare opportunity, you are advised to sign up quickly. This workshop will fill quickly. - All materials, except for brushes, will be included. - Workshop days are at the artstudio of the Anam Cara centre and are from 10 to 18hrs. - Each workshop day will start with a guided meditation, to access more creativity and guide you to a deeper connection with the spirit of the animal and your painting. Li Lian Kolster is an artist from England of mixed heritage. Committed to both her creativity and to apprenticing traditional Shipibo plant medicine, she began to learn to paint in 2013 while in the forests of Peru for 8 months of isolation. After an initial introduction to painting by Luis Tamani, Li Lian continued to self teach and develop her practice and technique. Li Lian has exhibited as well as performed live painting at both events and festivals around the world. In 2017 she became an instructor at the Vienna Academy of Visionary Art, teaching her painting techniques for a trimester. Li Lian’s paintings have been inspired by the sacredness of nature, healing and transformation, the shamanic worlds of plant medicine and animal spirits. Tuition:: 670 € course + 170 € materials & 7 warm vegan meals, drinks and snacks. This includes a Sta-wet palette which will revolutionize your painting experience. I understand that the Anam Cara center is an alcohol- and drug free center and substances, including plant-medicines, are not allowed . I will respect this during my stay. I would like to stay at the Anam Cara centre and want to receive more info.